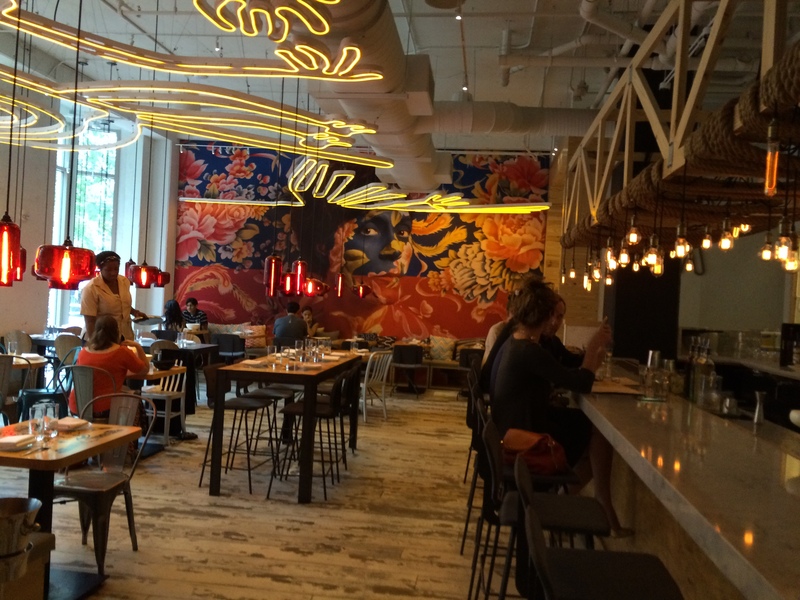 With DC restaurants opening at a dizzying pace, it’s critical to stand out. China Chilcano, which opened in Penn Quarter this past January, has a multitude of merits that make it notable. 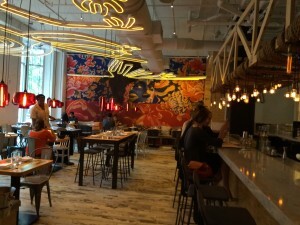 It is one of the newest additions to Jose Andrés’ DC restaurant empire, which continues to grow. Andrés is one of DC’s most recognizable restaurateurs. His approval rating rises when he decides to back out of a planned flagship restaurant in DC’s under-construction Trump Hotel. “As a proud Spanish immigrant and recently naturalized American citizen myself, I believe that every human being deserves respect, regardless of immigration status,” Andrés said when announcing his decision. This is perfectly timed with my planned first visit to China Chilcano. I’m more than willing to express my support. China Chilcano is further distinguished by its unique Peruvian dishes accented with Chinese and Japanese techniques and ingredients. The two cultures have influenced the region significantly, and the cuisine effectively demonstrates how they all intertwine. Traditional South American ingredients such as aji amarillo peppers, leche de tigre (tiger’s milk) and avocado are paired with Japanese bonito flakes and furikake (rise seasoning), as well as Asian vegetables and fried rice. 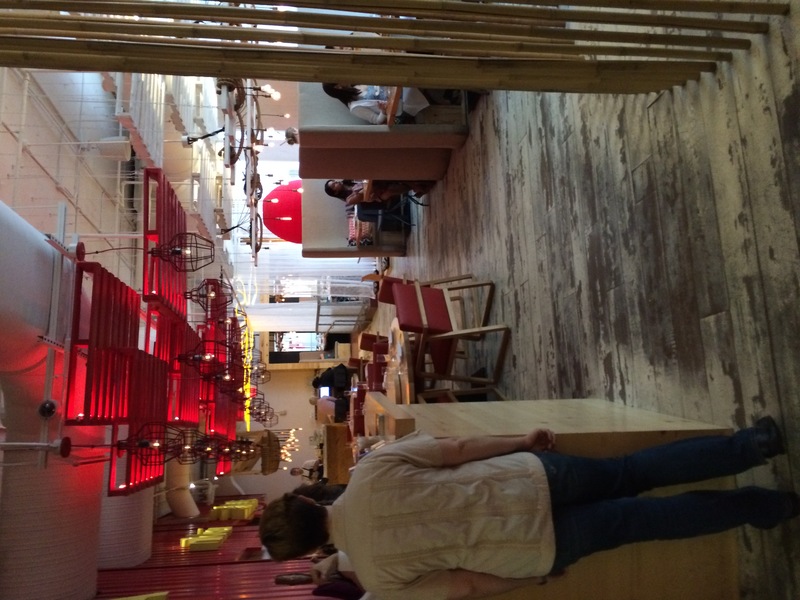 The decor at China Chilcano is an energizing fusion of rustic meets pops of bright colors. The focal point, a brightly colored mural by Peruvian artist Cecilia Paredes, is memorable. 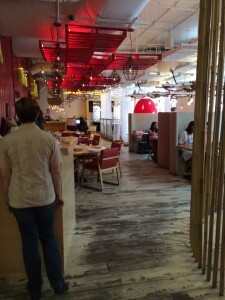 The menu is overwhelming, so relying on advice from servers, friends, reviews, or blogs is a good move. Advance preparation doesn’t fully erase the difficulty in knowing where to focus attention between the choices of ceviches, dim sum, rolls, sashimi, salsas, and more traditional Peruvian dishes. I’ve been advised to try Ceviche Nikkei. 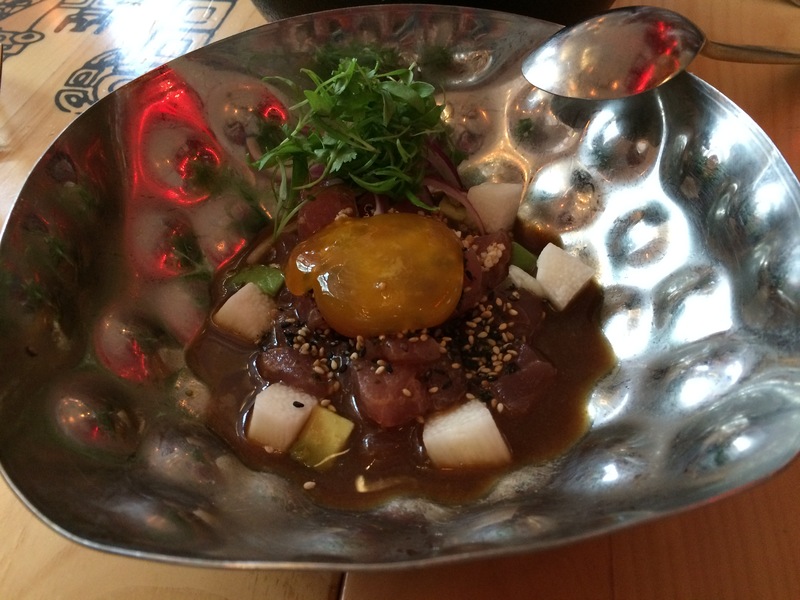 This is a compelling combination of Bigeye tuna, soy-cured egg yolk, Nikkei leche de tigre, puffed quinoa, avocado, mountain yams, red onion, and furikake. It’s not unlike the restaurant itself, with a frenetic blend of ingredients that ultimately come together. I find the slightly less fussy Ceviche Clásico La Mar just as satisfying, with ingredients that include fresh fish, leche de tigre, sweet potato, red onion, toasted corn, and cilantro. A dish that further exemplifies the merger between Peruvian and Japanese is Dancing Yucca. 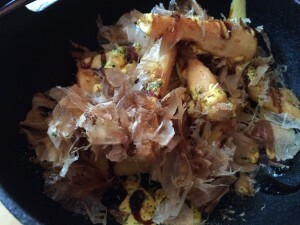 Yucca fries are topped with aji amarillo aioli and blanketed with bonito flakes and a dusting of seaweed. The dish is initially appealing, but eventually the bonito becomes overwhelming. 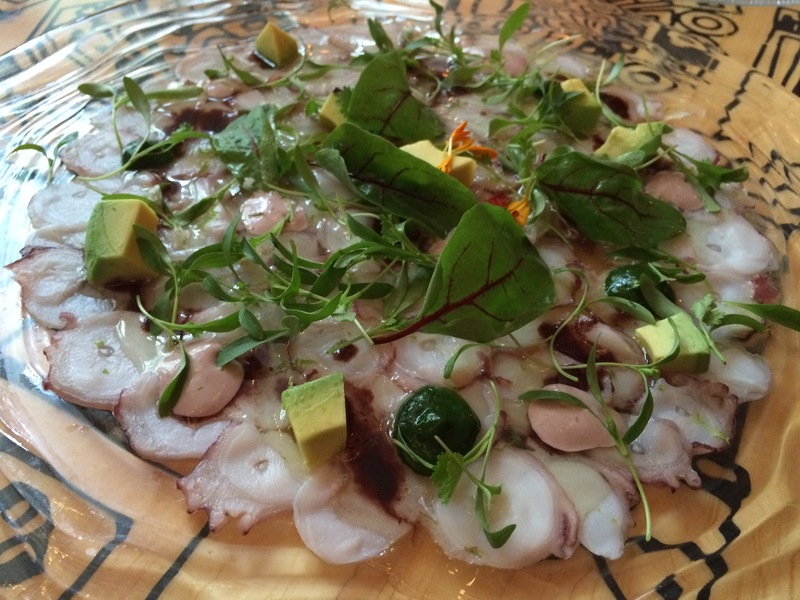 I am also encouraged to try Pulpo al Plivo Rosita Yimura , a picturesque dish featuring very thin slices of marinated octopus, black olive mayo, and diced avocado. 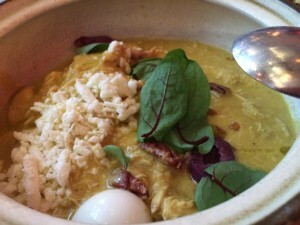 The dish has a zesty exuberance, and its ingredients compliment each other exceptionally well. This is a generously portioned dish, probably best for three or more diners to enjoy. Many of the dishes are gorgeous to look at, but our most beautiful dish award goes to Pegao Norteno. 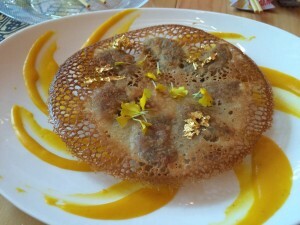 Lamb pot stickers are tucked into a lace pancake which is dusted with gold flakes. The bits of lamb, thin crispy pancake, and delicate sauce make for a delectable dish. Ají de Gallina is described as “Peru’s most precious dish.” The stew of chicken, ají amarillo peppers, botija olives, cheese, pecans, and rice is the heartiest of our dishes, and a pleasant conclusion to the savory portion of the meal. 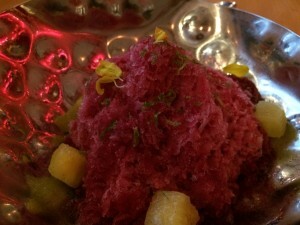 My dessert of choice is shaved purple corn ice with pineapple, which is perfectly refreshing. The shaved ice is Asian-inspired, while the corn reflects the Peruvian side of this innovative concoction. 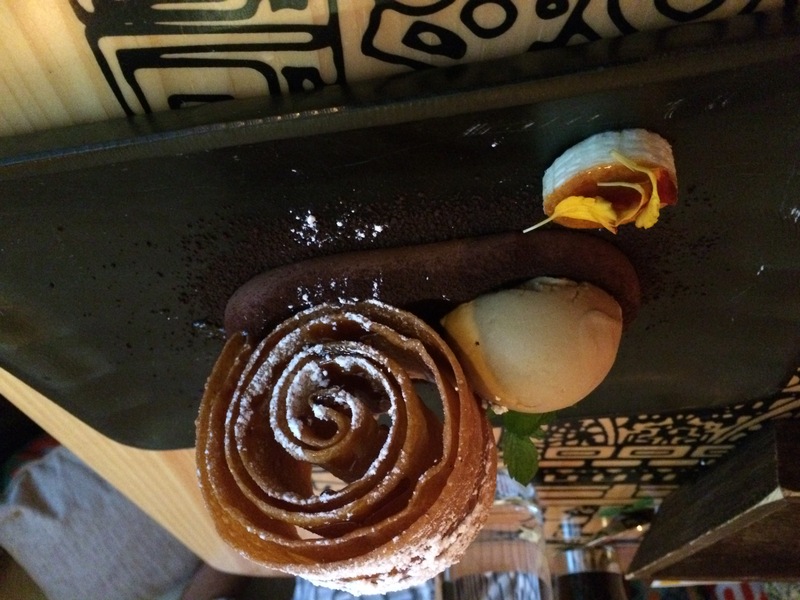 Crispy fried spiral cookie with chocolate cream, banana, and ice cream is equally enticing, with its snail-like appearance. China Chilcano trumps many of the new restaurants in town with its distinct perspective and flavors. 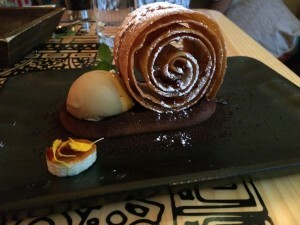 Bravo to Jose Andrés for bringing DC another great restaurant, along with a viewpoint that deserves respect.